World Record (Northern) Pike -- 55 lbs. 1 oz. 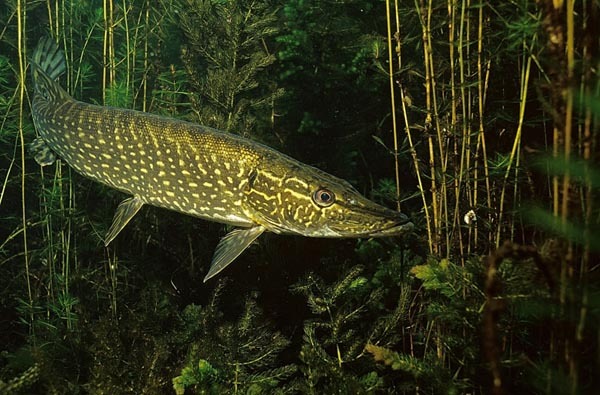 This toothy creature (often called the Northern Pike) range across the fresh waters of northern North America. They can also be found all across Western Europe. Some have even been reported in Siberia. These fish are hatched from a brown egg that attaches itself to weeds in waters that are either slow moving or standing. Once laid, the eggs hatch in approximately two weeks and the fish matures in two to four years. 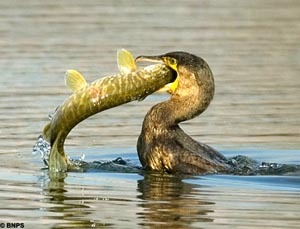 The young ones feeds on small invertebrates, then on other fish when maturity is reached. They will live for an average of 12 to 15 years and can be as long as 72”, weighing around 70 pounds. It is common to catch these lovelies at upwards of 40” long and weighing more than 30 pounds. Their coloring is a muddy gray-green with stripes or spots that make them the “ultimate soldier” among predatory fish. Each individual fish’s markings are like a fingerprint and no two are alike. Yes, this guy is a predator (not like the one from space in the movies) and will feed on its own kind. Typically, though, it will take injured or dying fish as a meal creating a natural ecopyramid (big word, huh?) with itself at the top. Interestingly, very young waterfowl have been known to be taken on opportunity. So keep your parakeet at home unless you need live bait. This is a basic, simple pike recipe. Take the flour, cayenne, salt and pepper, and mix in a large bowl. Bread the fish in this flour mix. Heat the butter in a cast iron skillet until the butter sizzles. Now take a shot of the Grand Marnier. Now add a shot of the Grand Marnier to the skillet. Once the skillet is hot, put the pike in the skillet. Cook until browned on both sides or about 5 to7 minutes. When the fish flakes with a fork, it’s time to enjoy dinner! For you Atkins dieters, this fish’s flesh has the leanest meat of all freshwater fish. 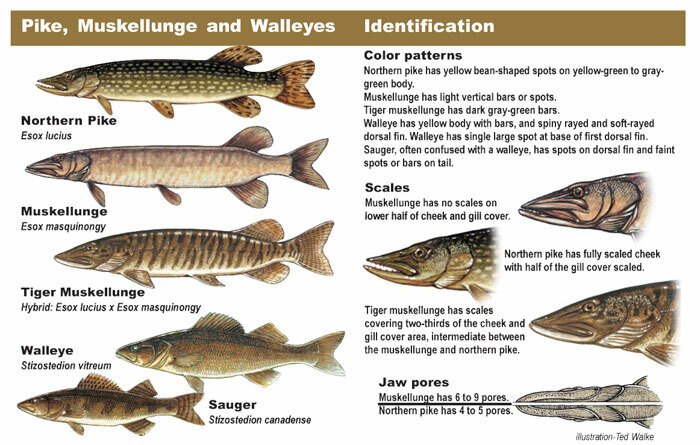 Often, the Muskellunge (Muskie) is confused with our toothy friend. While they are in the same scientific family, there are some differences. Mostly the difference is in the colorings; the Muskie is silver, green or brown with vertical stripes along the body. For other differences, please refer to the identification chart at the top of this page.